I/O mapping assigned by PCI BIOS. Memory mapping assigned by PCI BIOS. four IRQ mapping assigned by PCI BIOS. number of port：4 ports per card. Note: Each serial port can set to RS422 or RS485 by DIP switch. Baud Rate: each port can be configured to 50--115200bps. Connector type: DB37 female connector. P485 cable support DB37 male to four DB9 male connector. A400 cable support DB37 male to four DB25 male connector. 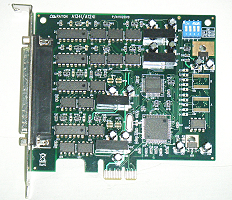 A134I card: 120 * 105 mm. A134I model with standard PCIe bracket.